Asia represents an important and growing market for Spanish wines, so we were delighted with the results in the Asia Wine Trophy awards announced at the end of 2016 in which Long Wines won six medals including five Golds and one Silver. With over 4,000 submitted wines and over 130 international judges, the Asia Wine Trophy is the most important wine competition in Asia. It is organised under the patronage of the OIV – the International Organisation for Vine and Wine – as is the case in the Berlin Wine Trophy. The awards included the first Gold Medal for the recently launched Las Carlinas Old Vine Garnacha 2014 from DO Campo de Borja. Casa del Canto 2013 from DO Yecla was another Gold Medal winner, adding to the two other Golds won this year in AWC Vienna 2016 and Mundus Vini 2016. Finca Mónica Crianza 2013 is another success story with the Rioja brand adding another gold medal to the gold won in AWC Vienna 2016 and the silver in Mundus Vini 2016; as well as the previous vintage being ranked within the world’s top 25 Tempranillos. Bos Tinta de Toro 2014 from the DO Toro received its fourth medal in 2016, with a Gold from the Asian Wine Trophy to add to the three silver medals from AWC Vienna 2016, Decanter World Wine Awards 2016 and Concours Mondial de Bruxelles 2016. 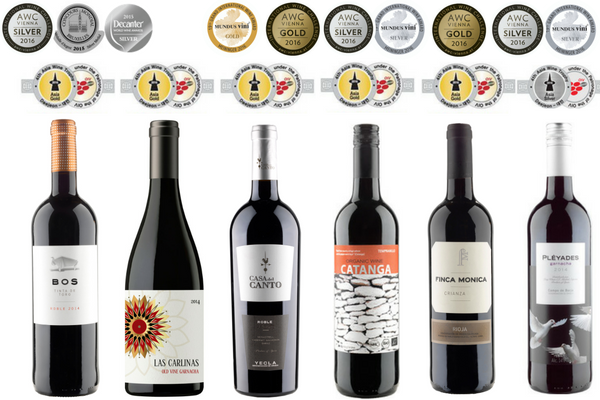 Catanga Organic Tinto 2015 also won its first Gold to add to its Silver from the AWC Vienna. The Asian Wine Trophy Silver went to Pléyades Garnacha 2015, its third this year, adding to its collection of Silver medals from AWC Vienna 2016 and Mundus Vini 2016. For information on our award-winning range contact the team at Long Wines.